LEDs are suitable for landscape lighting systems due to their energy efficient and quality lighting features. Below explains how you can use LEDs for your outdoor landscape. Before diving into specific types of LED fixtures for landscape lighting, one should first understand the foundation of outdoor lighting techniques. Knowing which techniques are applicable to your landscape may determine the types of LED lights you need to purchase for the applicable area. Highlighting: This technique involves using spotlights at the floor or base to highlight a specific object, such as trees, statues, signs and ornaments. Adjusting the distance and angle of the fixture is an effective way to ensure that the beam targets the entire object. It is possible to use more than one fixture when using this lighting method (usually applicable to large objects). Variations of this application includes silhouetting, or aiming the light towards a nearby wall to create an indirect, illuminated backdrop. For a less pronounced shadow, which is ideal for trees with soft features, it is recommend to apply the shadowing technique. Path Lighting: Path lighting refers to small fixtures located along the borders of patios, driveways and walkways. They are designed to provide guidance for individuals passing through the area. Lamps that emit light with a radius of 360 degrees are suitable for such applications in order to illuminate as much of the area as possible. Most individuals also prefer fixtures with covers to prevent blinding when walking over the units. Down Lighting: Down lighting is useful for illuminating large portions of the landscape. The straightforward approach involves installing the light from a high position, possibly from a tree or eave, with the beam pointing downwards. It is a common preference for the light to spread wide during illumination. Moonlighting is a variation of this technique, which mimics light coming from the moon. Aesthetically, this method creates flashy shadow patterns from the downward angle and placement of the light. Wall Washing: Wall washing is suitable for bright lighting requirements for walls. To generate a bright, even light, it is recommended to install the fixture slightly angled, roughly three feet away from the wall. Spotlights are not recommended for this type of configuration. 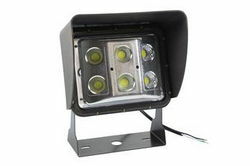 Instead, wide-angle flood lights are appropriate for wall washing applications. For direct wall lighting, the up lighting technique is highly applicable. Compared to wall washing, fixtures that are installed using the up lighting method are not angled widely. The units are pointed straight up and positioned closer to the wall. Spotlights maybe used for up lighting configurations. Accenting: Accenting is broadly used in landscapes to draw attention to a specific object. Unlike highlighting, the application involves installing the light directly below or above the object. Most individuals prefer using a small, narrow beam spotlight during installation. Compact versions of the fixture are convenient for hiding the unit under rocks, flowers or foundations of the target object. Outdoor lights are regularly exposed to unpredictable conditions, including rain, snow, corrosion and impact. Because of this, one needs to pay close attention to the light’s approval ratings and features during the purchasing process. To prevent costly replacement and maintenance, it is recommended to use lights with water and impact proof ratings. This could prevent premature failure during rainy seasons, humid conditions and accidental collisions. If you’re in an area close to the ocean, try looking for corrosion resistant LEDs with marine approval ratings. The lights are designed to withstand exposure to saltwater and other corrosive agents that could easily damage conventional fixtures.